The British Gazette » Brexit: Throwing dice. 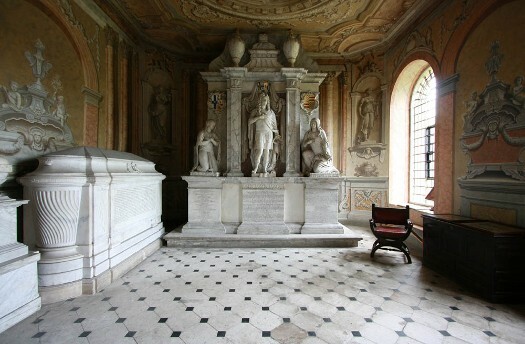 Above, the Chandos Mausoleum, St Lawrence Whitchurch in Harrow, Middlesex. Of James Brydges, 1st Duke of Chandos it can reasonably be said that he was the greatest fraudster in British criminal history. Brydges acquired his fortune through embezzlement of the public purse on a grand scale. With it he built a vast palace called “Canons” nearby Harrow. It no longer stands for Brydges was as much a gambler as he was fraudster and his son, the 2nd Duke sold the estate to settle his father’s debts. The house was demolished and it’s ornate interiors were reused elsewhere. An early example of recycling! Brydges lost much of his money when the South Sea bubble burst. Today, Doctor North likens the hole the UK is in to a throw of dice. I myself am a bit of a gambler! This morning through the post, I received my January quarterly statement of Voluntary Class 3 contributions due from HM Revenue & Customs – with them asking for another £190.45. By a quirk of fate, when the government raised the state pension entitlement age for persons born after October 1954 from 65 to 66 causing me a delay of one year; they gave me the opportunity of making 35 years NI contributions – for had they not done this I would have only had 34 years contributions, resulting in a pension of 34/35ths or 97% and not a full state pension. The gamble is this: come October 2021 will I be able to claim a full state pension? If a “No Deal Brexit” takes place, this is extremely doubtful! This because the economy will have taken such a hammering and the public finances will be in such a dire strait, whichever government happens to have the great misfortune to be in office at the time will have been forced to embark on the most rigorous austerity measures. The state pension is one of the biggest demands upon the public purse and it is inevitable that this will have to be addressed. The one way in which great savings can be found is to replace the universal state pension with a means tested alternative. For legal reasons there will have to be a universal element however. One can therefore expect there to be two pensions, a “universal pension” possibly only half or even a quarter of what currently is to be expected with a means tested “supplementary pension” making up the other half or three quarters. Working on the worst case scenario, instead of receiving £8,546.20 pa, I am more likely to receive £4,273.10 pa or maybe only £2,136.55 pa! I suppose I will have to look upon the situation stoically. At least receiving £2,136.55 is better than receiving £0.00! Of course the worst thing is that I will have nobody to blame apart from myself! The question I have to ask of myself is this: Should I continue to make voluntary payments to HM Revenue & Customs of £761.80 pa after the April 2019 statement? The answer will be decided on what happens at the end of March! You see, failing to make contributions in Year 34 (2019-2020) and Year 35 (2020-2021) will result in a 33/35ths or 94.28% pension. Thus if all I am going to receive based on 35 years contributions is a paltry £2,136.55 pa, I might as well save £1,523.60 and receive £2,014.46 pa as I will only loose after 12 years. Readers may like to note an interesting historical note on Chandos. Some of its features were taken to the Parish Church in Great Witley in Worcestershire. This is a highly decorated baroque church and well worth visiting.. The organ case is the same that Handel would have looked at when playing the instrument at Chandos. The decorative wood carving and front gilt pipes are the original although the internal pipework came later. Some windows and possibly the highly ornate ceiling is said to be from Chandos which, as the British Gazette says, no longer exists. Why Great Witley ? Maybe Lord Foley, a wealthy landowner there, commissioned the move. Do go and see it for yourself..